Four schools have been forced to close because infestations of false widow spiders have been discovered. Ellen Wilkinson Primary School, Star Primary School, Lister Community School and Rokeby School in east London were closed on Wednesday after the finds. 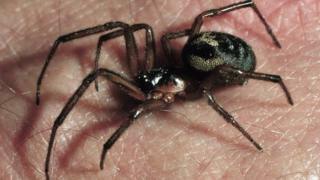 False widows are about the size of a 50p coin and are the most dangerous spider species in the UK. Newham Council said it was working with the schools to ensure "children can continue to receive an education". The schools are all within a two-mile radius of each other and are being "treated and fumigated", the Local Democracy Reporting Service reports. A spokeswoman for Newham Council said the closures have been implemented "at the head teachers' discretion [...], as these infestations were in a number of locations across the school sites". She said the spiders which "only bite if mishandled or provoked" were first discovered on Tuesday. Bites from false widows can cause painful swelling but are not life-threatening. In a letter to parents, Star Primary School said the council's environmental team found the infestation during a routine check and "believe [it] is contained to the outside of the building and that this needs to be treated immediately before the eggs start hatching". "Pupils are being set work via the schools and will remain in contact with schools," a council spokeswoman said. Anne-Marie Fenttiman, 36, whose son Mitchell goes to Rokeby School, said: "My son is upset, he just started school and he likes being there. "Luckily, I'm a stay-home mum so I can be here with him. It would be very different if we both worked full-time - as many other parents do." Ms Fenttiman, from Canning Town, said her friend was bitten by a false widow earlier this year and told her he was "in hospital for two days and still blisters and flares up". Ellen Wilkinson Primary School in Beckton said in a letter it expects to be closed for most of next week. Star Primary School in Canning Town said in a letter to parents it would provide an update on the length of the closure on its website next week. Lister Community School in Plaistow hopes to be open by Friday while Rokeby School in Canning Town will be closed until 29 October. Newham Council has urged all schools and nurseries in the area to "check their premises carefully for these spiders" and call pest control if they see any signs. In 2015, two schools in neighbouring Tower Hamlets were closed in 2015 due to the same infestation.